Cyclone Ita recently threatened havoc in Far North Queensland but this time, apart from in the Cooktown region which wore the brunt of its force, homes and gardens escaped with minimal damage. Tabu in Freshwater, Cairns, is a magnificent property that could have been devastated but talented owners Mark Vowles, and his interior designer wife Fairlie Kerr, were relieved to emerge with less tidying than expected – especially as their garden is open for visitors on one special weekend: 31st May & 1st June 2014. From the road glimpses of the garden, with plants grown on gentle mounds and in curved beds, are tantalising. 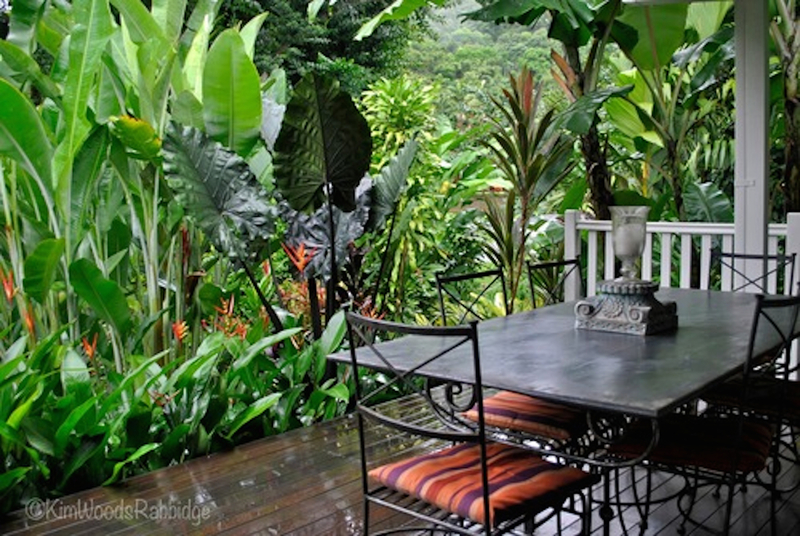 Tabu benefits from a rainforest backdrop, and Mark has carefully sculptured the hillside for the best topography – ensuring essential drainage, pathways for access, and platforms for planting. 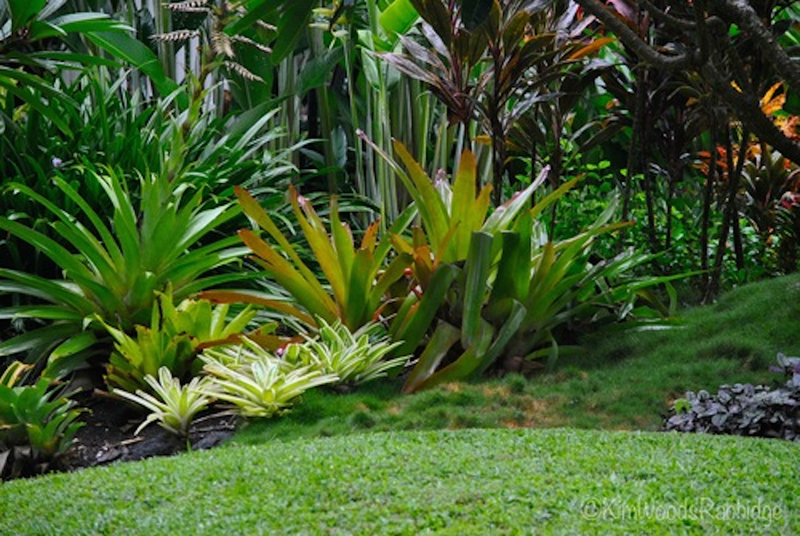 The couple’s style carefully considers colour and textural palettes using a wide range of tropical plants. Fairlie’s choice of a deep navy paint for the dwelling makes the perfect foil for verdant plants, and many hot-hued leaves and blooms. Mark first fell in love with tropical gardens when visiting the stunning Cairns Botanic Gardens over thirty years ago. His desire to immerse himself in a lush, exuberant landscape first led to horticultural studies, then landscaping, and onto his own much-admired sub-tropical garden at Deception Bay, Brisbane. However Far North Queensland, with its truly tropical climate, beckoned and the couple finally moved to Cairns in 2010 to fulfil their dreams. Heliconia Indica ‘Rubra’ shoot flame-like above the surrounding foliage. From the sheltered deck guests soak in the garden’s ambience and reflect on the detailed mosaic of flora. Despite the sometimes overwhelming lushness of tropical gardens restraint is actually the hallmark of success. Mark’s clever use of mass plantings and prudent use of focal points to draw us through the garden is ingenious. Riedelia coralina with blood red stems and lime green leaves are simply delicious. Curly stems of Costus specious emulate an iron chair’s swirls. Stacked concrete blocks serve as a pedestal – neat! Urospatha sagittifolia makes an interesting focal point in a water vessel. Another simple yet effective feature: along a pathway Mark’s installed several pedestals of interconnected pipes supporting a disk, in which he’s planted walking iris. A raised pool settled into the landscape, is partly disguised by Rhapis palms planted along the edge. Curiouser and curiouser… Calathea crotalifera are aptly known as ‘Rattle Shaker’ calathea. Sadly we leave Tabu now but if you’re lucky enough to be in Cairns at the end of the month you can visit this amazing, exciting garden and meet Mark and Fairlie. What a treat! ONLY OPEN: Saturday 31st May & Sunday 1st June 2014.